SINTOK, 17 July 2012 – The people have been advised not to be too taken up by intense politicking in fighting for democracy to the extent of compromising the continued well-being of the country. The Tengku Temenggong of Kedah, Brigediar Jeneral (Hon) Dato’ Seri Diraja Tan Sri Tunku Sallehuddin Ibni Almarhum Sultan Badlishah said the people should not be unduly influenced by what is happening in some countries overseas since harmony of the people and stability of the nation needed to be upheld. He was speaking at the 31st Commissioning Parade of The Reserve Officer Training Unit (ROTU) for Public Institutions of Higher Learning here today. Taking a lesson from events going on in some countries resulting in conflicts, fighting and civil war, he said such conflicts will only bring about the destruction of the country. The people here should thus ensure that such causes would not lead to disorder and chaos. 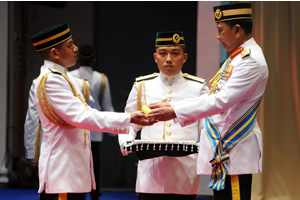 A Science and Technology student, 2nd Lieutenant Mohd Noor Afinddie bin Rositi was judged as the best cadet officer for UKM ROTU. Mohd Noor from Bandar Seri Jempol Negeri Sembilan was delighted with the honour and hopes to continue serving with the Territorial Army. 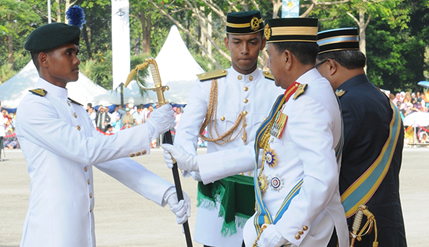 Head of UKM ROTU training, Lt Col Mohd Sahar bin Haji Said was proud of the achievements of his charges at the passing out parade. Commandant of UKM ROTU, Vice Chancellor Professor Tan Sri Dato’ Wira Dr Sharifah Hapsah Syed Hasan Shahabudin attended the function.